Insider Monkey has processed numerous 13F filings of hedge funds and famous investors to create an extensive database of hedge fund holdings. The 13F filings show the hedge funds’ and investors’ positions as of the end of the fourth quarter. You can find write-ups about an individual hedge fund’s trades on numerous financial news websites. However, in this article we will take a look at their collective moves and analyze what the smart money thinks of Twilio Inc. (NYSE:TWLO) based on that data. Is Twilio Inc. (NYSE:TWLO) a buy here? Investors who are in the know are getting more optimistic. The number of long hedge fund bets advanced by 5 in recent months. 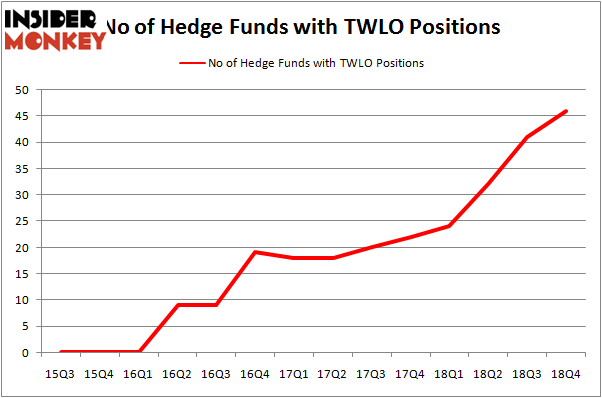 Our calculations also showed that TWLO isn’t among the 30 most popular stocks among hedge funds. Let’s analyze the new hedge fund action regarding Twilio Inc. (NYSE:TWLO). What does the smart money think about Twilio Inc. (NYSE:TWLO)? At Q4’s end, a total of 46 of the hedge funds tracked by Insider Monkey were bullish on this stock, a change of 12% from the previous quarter. Below, you can check out the change in hedge fund sentiment towards TWLO over the last 14 quarters. With the smart money’s capital changing hands, there exists an “upper tier” of key hedge fund managers who were boosting their holdings meaningfully (or already accumulated large positions). More specifically, Whale Rock Capital Management was the largest shareholder of Twilio Inc. (NYSE:TWLO), with a stake worth $219.8 million reported as of the end of September. Trailing Whale Rock Capital Management was Foxhaven Asset Management, which amassed a stake valued at $198.7 million. Renaissance Technologies, SCGE Management, and D E Shaw were also very fond of the stock, giving the stock large weights in their portfolios. As one would reasonably expect, key money managers have been driving this bullishness. Coatue Management, managed by Philippe Laffont, initiated the largest position in Twilio Inc. (NYSE:TWLO). Coatue Management had $86.1 million invested in the company at the end of the quarter. Brandon Haley’s Holocene Advisors also initiated a $65.8 million position during the quarter. 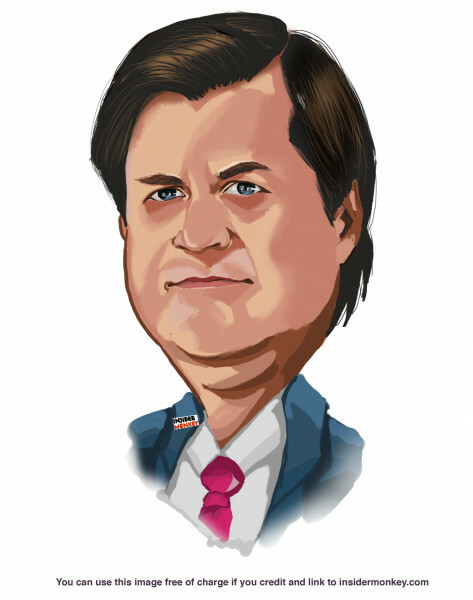 The other funds with brand new TWLO positions are Glen Kacher’s Light Street Capital, Josh Resnick’s Jericho Capital Asset Management, and Mark Moore’s ThornTree Capital Partners. Let’s now review hedge fund activity in other stocks similar to Twilio Inc. (NYSE:TWLO). We will take a look at Viacom, Inc. (NASDAQ:VIAB), Yandex NV (NASDAQ:YNDX), HollyFrontier Corporation (NYSE:HFC), and Everest Re Group Ltd (NYSE:RE). This group of stocks’ market caps are similar to TWLO’s market cap. As you can see these stocks had an average of 28 hedge funds with bullish positions and the average amount invested in these stocks was $593 million. That figure was $1507 million in TWLO’s case. Viacom, Inc. (NASDAQ:VIAB) is the most popular stock in this table. On the other hand Yandex NV (NASDAQ:YNDX) is the least popular one with only 23 bullish hedge fund positions. Compared to these stocks Twilio Inc. (NYSE:TWLO) is more popular among hedge funds. Considering that hedge funds are fond of this stock in relation to its market cap peers, it may be a good idea to analyze it in detail and potentially include it in your portfolio. Our calculations showed that top 15 most popular stocks among hedge funds returned 21.3% through April 8th and outperformed the S&P 500 ETF (SPY) by more than 5 percentage points. Hedge funds were also right about betting on TWLO as the stock returned 26.8% and outperformed the market as well. You can see the entire list of these shrewd hedge funds here.